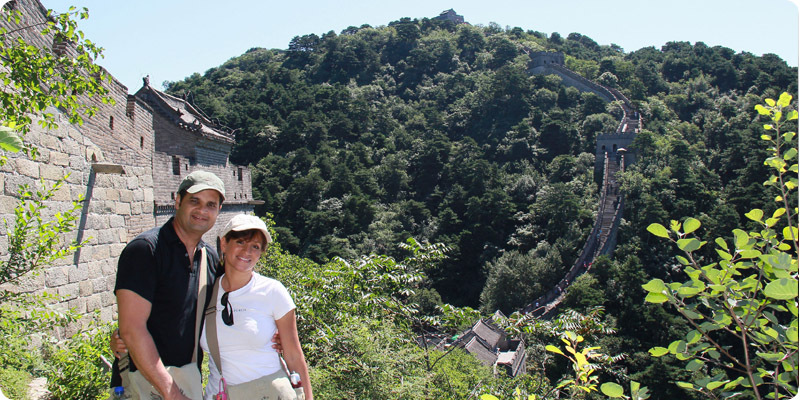 Visit the best sights of imperial China with this unique tour package, explore the life of locals in Beijing and enjoy walking over the Great Wall of China. Within the package, customers get an included transfer through Tianjin Cruise Port and Beijing International Airport with customizable schedules. The Customers won’t have to wait in lines and can explore the largest imperial palace located in the Forbidden City. Customers will also be able to enjoy a beautiful sunset from the Great Wall at Mutianyu after two hours of hiking on world’s eighth wonder. At Jingshan Park, travelers will be able to enjoy a bird’s eye view of the country’s capital along with a panoramic view of the Forbidden City. Customers can also enjoy free facilities of beer, water and more when visiting the Mr orange Refreshment Kiosk. Customers opting for our package will have constant connectivity at all times and places through our portable Wi-Fi system. Our services won’t waste your time at shops, factories or any other places of little interest and no hidden or extra costs will be charged to customers. Expert one to one consultancy provided by us while visiting China along with limitless itinerary changes. Booking of internal flights, cruises and trains as per customer preferences while travelling inside China. After arrival at Tianjin Cruise Port, the customer will be transferred to Beijing where they can visit the Beijing Olympic Stadiums and the Summer Palace. Meals provided will include breakfast and a Chinese lunch at the Chong Xue Villa Restaurant. Accommodation will be provided at the Novotel Peace Hotel or Crowne Plaza Beijing Chaoyang U-Town, while Novotel Peace has a 4 star rating, the Crowne Plaza has a TripAdvisor Certificate of Excellence along with a 5 star rating. Customers will stay in the same hotels during their entire stay to avoid hassles and time expenditure in shifting luggage. Our tour guides will be waiting for the customers at Exit 3 from 6:30 am with China Highlight boards at the airport. A personal guide will lead the tourist to the private vehicle and drive to the hotel taking around 2 hours to reach downtown Beijing from port. After exploring the vast garden, Customers can have lunch and relax at the Chong Xue Villa Restaurant located at a distance of 10 minutes by foot. Filled with great environment, the Chong Xue Villa consists of ancient architecture of China along with a beautiful garden offering delicious Cantonese cuisine to customers. 1 Hour visit to Beijing’s Olympic Stadiums i.e. Water Cube and Bird’s Nest: The Beijing Olympic Park is a huge area of 1,215 hectares located on the north end at on the centerline of Beijing City. The area contains an exhibition area along with National Museum of China, venues for Olympic competitions and the Olympic Village. The Beijing Olympics were held at 31 venues including the National Stadium commonly known as the Bird’s Nest along with the National Aquatics Center which is referred to as Water Cube. Customers are allowed to explore the park but going inside the Water Cube and Bird’s Nest isn’t included within the trip package. Mobility Assistance: We are happy to provide a wheelchair or walking sticks for customers who need assistance in walking. We would also welcome your advice to help you better with the same purpose. While visiting Tianjin, Customers will be able to see the famous Tiananmen Square, the Forbidden City and have a tour of Hutongs. The tour will start nearly at 8:30 am on the second day following breakfast at your hotel. 40 Minute visit to Tiananmen Square: Holding massive cultural significance, this site has been the witness of several key events in the history of China. The Tiananmen Square is the largest popular city square in the entire world and is an enduring symbol for national pride in China while being surrounded by numerous grand structures including various museums, government buildings, the Masoleum of Mao Zedong and the Gate of Heavenly Peace which also serves as entrance to Forbidden City. 2 Hour Visit to the Forbidden City: Having been the home to 24 emperors between 1368 and 1911, this is a “city within a city” marked as a World Heritage Site by the UNESCO. Being the best preserved and largest architectural complex in the world belonging to the ancient imperial period, this place features a great square along with halls and gates contrasting the intricate gardens, halls, quarters and courtyards. Invoking fascination among visitors, temporary and permanent exhibitions are significant treasures belonging to ancient China. Dumplings in Hutong Taste Kitchen: With a traditional setting, the Hutong Taste Kitchen offers the opportunity of experiencing the local culture and mingling with people directly. The host will teach Customers to make dumplings using simple seasonings and ingredients followed by combined effort from everyone to mix fillings, knead dough, roll wrappers and pinch dumplings. Customers often get to hear traditional Chinese stories while learning new technique and skills to make dumplings. The friendly and relaxed environment at this place is a great option to have fun with family, friends or colleagues during the visit. For lunch, the Customers will be able to enjoy their self-made lunch. 1 Hour Hutong Tour in Dongcheng District: This place is a maze of old alleys and traditional single storied courtyard houses which are disappearing quickly in today’s times. Customers can take a rickshaw to ride in the narrow alleys and visit local families. On the third day, Customers can visit the Temple of Heaven and the Great Wall of China at Mutianyu along with a round trip in cable car. 1 Hour visit to Temple of Heaven: Covering an area of 273 hectares, this place was built in 1420 by the Ming Dynasty and declared as a World Heritage Site in 1998 by UNESCO. The temple consists of a befitting small place known as the Hall of Abstinence where the emperor would stay for three days before holding an annual ceremony to offer prayers for a good harvesting season. The emperor wouldn’t return to the palace during the three days and abstain from consuming meat or wine and also refrain from any kind of mourning, entertainment or political activities to display his piousness towards Heaven. Customers can see the pictures of all emperors who worshipped in the temple along with a 6 century old copper stature of the high ranking official who provided supervision for the fasting process of emperor. Xin Shuang Quan Restaurant is a garden styled restaurant located near to the Great Wall’s Mutianyu section. Serving farmhouse dishes the rainbow trout offered at this restaurant is a true delicacy with a fabulous taste. 2 Hour visit of the Great Wall at Mutianyu: Owing to fewer Customers, astounding scenery and well restored architecture, this section of the Great Wall has been ranked at the top on TripAdvisor. To save around 4o minutes of climbing time and efforts, the Customers are provided with round trip ride in cable cars for ascending and descending the Great Wall. Your private guide will be alongside while hiking through the most interesting and beautiful part of the Great Wall C as acknowledged by hikers starting from watchtowers 14 C till 23 C. Price of the cable care and transfer bus rides are after leaving the personal vehicle are included within the package. To avoid extreme crowds on the Great Wall and traffic jams on the way, we visit during the afternoon which is also the best time for photography due to good natural lighting. A refreshment kiosk has been set up by near the foot of Great Wall in Mutianyu where customers of Mr orange can receive free drinking water, maps and even beers. This is the final day of tourist’s stay ending with the departure from Beijing. Breakfast is provided at the hotel after which a private transfer will take the tourist over an hour long journey from downtown Beijing till the Beijing Capital International Airport. The time of collection will rely on the timing of the flight. Your private tour guide and driver will be there to pick you from the hotel and drive you to the airport directly. The return flight ticket is not included within the package. We also provide transfer through train station to customers. We request Customers who require such train transfers to let us know of their requirements accordingly.